"Now the most important right we have is the right to be responsible." These are the words of Gerrald Amus, Kitimat Village elder, from Patagonia's new video about the Skeena River, its salmon fisheries and the communities along it. Patagonia is an outdoor clothing company that's demonstrated business can be ethical, promote conservation and sustainability and be profitable at the same time. Now working with the First Nations of the Skeena, they're beginning a new venture—salmon products. Port Orford Ocean Resource Team's 2011 Water Festival. Ocean Resource Team photo. By their nature, the salmon and steelhead fisheries, the watersheds and the communities of the Chetco River and Oregon's Wild Rivers Coast are different from those in British Columbia. But perhaps this beginning on the Skeena River can serve as added impetus for finding our own unique ways to preserve and restore the watersheds and wild fisheries of the Elk, Illinois, Chetco and Smith Rivers and grow healthy communities at the same time. See Patagonia's thought provoking video below and read about some of inspiring work that's already happening on the Wild Rivers Coast. The Chetco River Watershed Council and the local Wild Rivers Chapter of Trout Unlimited are sponsoring: Family Day on the Chetco River. Come and enjoy a day at Loeb State Park on Saturday May 12th, 2012 starting at 11:00 a.m. and ending at 3:00 p.m. Free hot dogs and soda will be served from 11:00 to 2:00 as well as free drift boat trips for the entire family. Life vests are provided for the drift boat trips. This event will provide an opportunity to ask questions about the health of the Chetco River and learn about the aquatic ecosystem and water quality measurements from biologists. Heavy rain will cancel the event. For additional information call (541) 661-1820. This idyllic reach of the upper Chetco River below Mislatnah Creek will be permanently protected from mining if Congress passes the Chetco River Protection Act before July 2013. Ann Vileisis photo. The recent forfeiture of nearly 20 miles of mining claims on the Wild and Scenic Chetco River means the effort to permanently protect this world-class salmon and steelhead river just got a whole lot easier. It also means there's a significant savings for the taxpayer with the potential for more. However, to take full advantage of this rare opportunity, Congress needs to pass the Chetco River Protection Act before July of next year. Learn how you can help. 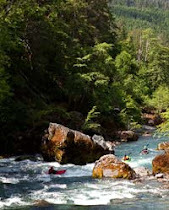 The National Wild and Scenic Chetco River provides world-class salmon and steelhead fishing and exceptionally pure domestic water supplies for Brookings and Harbor. But it also offers it's own memorable brand of high quality recreational opportunities that are hard to find elsewhere. One reason is there are few entirely free flowing rivers with such a high percentage of their watershed in Wilderness or Roadless Area condition.